Access to fixed or available forms of nitrogen limits the productivity of crop plants and thus food production. Nitrogenous fertilizer production currently represents a significant expense for the efficient growth of various crops in the developed world. 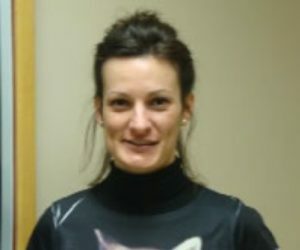 There are significant potential gains to be had from reducing dependence on nitrogenous fertilizers in agriculture in the developed world and in developing countries, and there is significant interest in research on biological nitrogen fixation and prospects for increasing its importance in an agricultural setting. Biological nitrogen fixation is the conversion of atmospheric N2 to NH3, a form that can be used by plants. However, the process is restricted to bacteria and archaea and does not occur in eukaryotes. 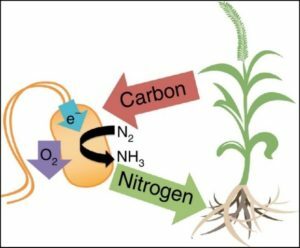 Symbiotic nitrogen fixation is part of a mutualistic relationship in which plants provide a niche and fixed carbon to bacteria in exchange for fixed nitrogen. This process is restricted mainly to legumes in agricultural systems, and there is considerable interest in exploring whether similar symbioses can be developed in nonlegumes, which produce the bulk of human food. A key part of developing synthetic symbioses to deliver nitrogen to non-legume crops (e.g. cereals) is to recognize the barriers to substantial rates of nitrogen fixation by bacteria and the transfer of fixed-N (as ammonium) to the plant. To provide the blueprint information to engineer synthetic symbiotic nitrogen fixation, we are using the strict aerobic nitrogen fixer Azotobacter vinelandii to 1) identify genes required for nitrogen fixation and diazotrophy; 2) understand the mechanisms of O2 protection, electron transfer and redox homeostasis to protect the nitrogenase enzyme and fuel the nitrogenase catalysis; 3) understand the interplay between ammonium assimilation and nitrogen fixation regulation. 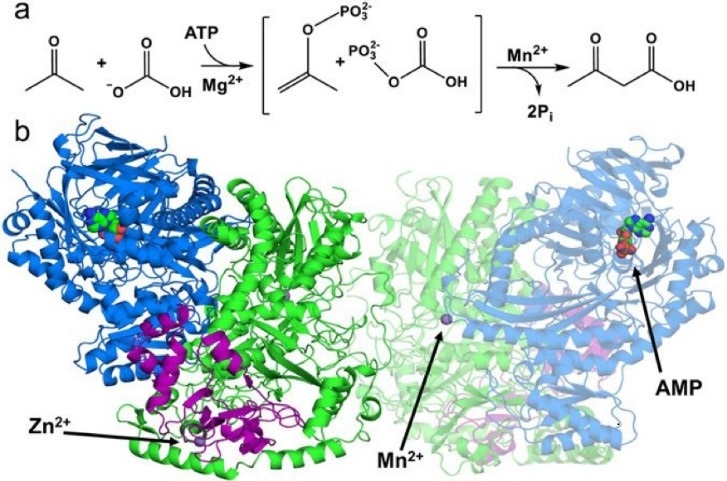 Novel convergent pathways in the model microorganism Xanthobacter autotrophicus have been described in which epoxides produced by alkene oxidation and ketones produced by the oxidation of alcohols are further carboxylated and utilized in energy yielding pathways. Both alkene/epoxide and alcohol/ketone pathways involve distinct carboxylases with unique molecular properties and cofactor requirements that represent alternative mechanisms of CO2 fixation. We are utilizing a multidisciplinary approach involving kinetic studies, site-specific amino acid substitution studies, and the determination of high-resolution structures of enzymes in the presence of substrate analogs and mechanism base inhibitors to ascertain information concerning the biochemical mechanisms of enzyme catalyzed reactions.